The Pack 65 Pinewood Derby was held Saturday, March 31 at the old Eli Whitney Fire Station. Everyone did a great job on their cars and the competition was close! We hope to have some pictures uploaded soon. Pack 65 will be represented at the District Derby by the top 3 finishers overall which were: Logan K., Zack M., and Marco C.
The results are available at the links to the right as overall standings for the scouts and Outlaws, as well as by Dens. Pack 65 takes 1st place at the 2012 Alamance District Pinewood Derby! 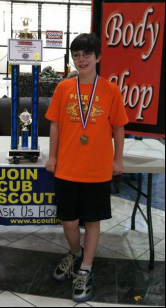 Three Scouts from Pack 65 competed at the Alamance District Pinewood Derby on May 12 at Holly Hill Mall. There were 41 cars entered in the race. The competition was so close that there was only six tenths of a second difference between the average time of the first place car and the tenth place car! Logan King won first place, which came with a large trophy and a family ticket package for Ace Speedway. His average speed was 217.1 mph. Marco Cruz finished 10th, with an average speed of 212.8 mph, and Zack McAdams finished 39th with an average speed of 175.9 mph. It should be noted that there were a few issues with the track starting gate that seemed to interfere with a few cars, causing a slower than normal run and we believe Zack's car was a victim of that. If they had dropped the slowest run like we do at our Pack 65 race then it would have been more fair for those affected by it. When the competition is so close it doesn't take much to knock a car out of contention. Every Scout who entered the race received a medal for their participation. We are proud of our Scouts for their good sportsmanship and for representing Pack 65 at this District event.